Starting important conversations, why not now? Since my goal as an author is to inspire others to be courageous and learn about their loved ones’ wishes, while creating life-long connections, I want to pose a question. The reality of life, as much as we try and not think about, is there is 100% chance that each of us will die. The unknown is when and how. I used to live with a false sense of security that tomorrow would come just like today. And then my mother died. My rock, my anchor, my confidant, my teacher. 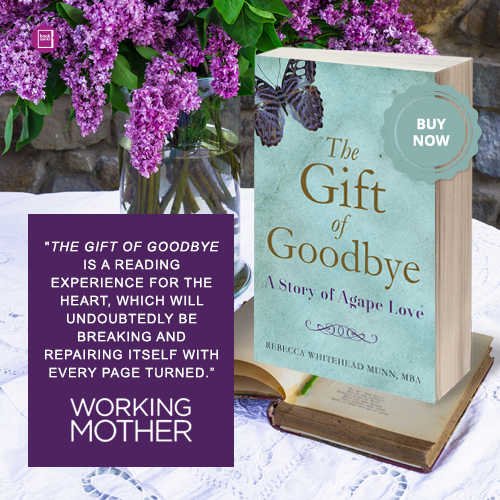 The blessing is because I wrote the Gift of Goodbye, my sister Susan, who had access to my early manuscript, was aware of my private conversations with mom. When she had emergency surgery 20 months ago and ended up in ICU, all of a sudden we were faced with the harsh, sudden reality that she would die, way too young. A few days before she took her last breath, she and I had a sacred conversation about her life, her wishes, and her regrets. I know that conversation happened because she knew I was open and willing. Sometimes loved ones leave us without even a few days warning. So what is keeping you from starting this important conversation now? I have enjoyed reading FINAL GIFTS by Maggie Callanan and Patricia Kelley and the following words helped me understand how we used to handle death. In our culture, we used to care for loved ones at home and we knew their wishes. Our culture supported coming to terms, in a gentle way, with someone whose life was coming to an end. “Once, the business of dying was a part of the business of living. With several generations of a family often residing under the same roof, children helped Mom and Dad care for Grandmother, who spent her last months on a bed in the living room. Or Grandfather came to live in what had been the sewing room.” In some cases, professionals provide the care today with family members being more on the sidelines or as spectators. Death has become a taboo topic, although it could be treated as lovingly as birth. Maybe today is a good time to start these important conversations, one step at a time? After all, none of us really know if tomorrow will come.